The new BMW M4 DTM opened its career with a dream result in Hockenheim. After 42 laps of the 4.574-kilometre circuit, Marco Wittmann crossed the finish line first in the Ice-Watch BMW M4 DTM, as the DTM opened its anniversary season with an eventful race. May 04, 2014 - Not only was it the 24-year-old’s first triumph in only his 11th DTM race, but also the maiden victory for BMW Team RMG and BMW’s 60th win in the series. On 11th March 1984, over 30 years ago, it was Harald Grohs at the wheel of the BMW 635 CSi who won the very first race in the history of the DTM for BMW in Zolder. Three years later, Grohs also won when the new BMW M3 made its debut in Hockenheim. Wittmann’s success saw the BMW M4 DTM continue this tradition of new cars winning on their debut. Six of the eight BMW M4 DTMs finished the race in the points. 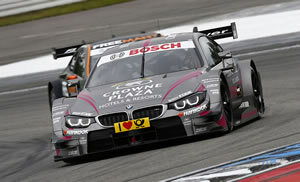 Timo Glock came home fifth in the DEUTSCHE POST BMW M4 DTM, followed by Bruno Spengler in the BMW Bank M4 DTM, Martin Tomczyk in the BMW M Performance Parts M4 DTM and Augusto Farfus at the wheel of the Castrol EDGE BMW M4 DTM in places six through to eight. Joey Hand also picked up a point, crossing the finish line in tenth in the Crowne Plaza Hotels BMW M4 DTM. The two rookies, Maxime Martin and António Félix da Costa, remain yet to score their first points, having ended their DTM debuts in 20th and 21st respectively. Félix da Costa was enjoying an outstanding race in his Red Bull BMW M4 DTM, and was in reach for a podium position for long periods. However, a collision with Timo Scheider and the subsequent drive-through penalty saw the Portuguese driver drop well back. Problems with a loose wheel after his pit top, coupled with the ensuing drive-through penalty, cost Martin any chance of a better result.